Home theater chairs are among the hottest furniture products around because they allow you to recreate the atmosphere of a cinema right in your own living room. If you're considering buying a few theater seats for your family to use and enjoy, you definitely won't regret it. But one concern you might have before making your purchase is how much space you'll have to set aside for your new furniture. Home theater chairs are generally larger than conventional armchairs and recliners, so space is definitely an issue you must consider carefully. For smaller viewing rooms, we carry many space saving theater seats from top manufacturers such as Palliser and Lane. These space saving units need only minimal wall clearance (typically 3 to 4 inches) to fully recline, which means you don't have to live in a mansion to be able to use them. Palliser Blade. These home theater chairs, which come in power and manual recline versions, are our bestselling space saver units. The Blade offers a 44" seatback that provides excellent support for taller users; a chaise style footrest for maximum comfort when in the reclining position; and an articulated headrest for better viewing. Lane Grand Slam. 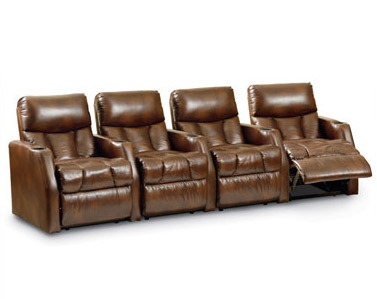 The Lane Grand Slam is available in power and manual recline models that need a mere 3 inches of wall clearance. Both models are finished in black bonded leather that is soft to the touch, and they come with super plush seatbacks for extra comfort. Palliser Magnolia. This model was made exclusively for Best Buy, and is designed to provide excellent features at a great price. Along with a deeply padded seatback and seat cushion that offer superior lumbar support, this chair also boasts cupholders and armrest storage compartments for added convenience. In addition, you can choose from a variety of leathers, fabrics, and colors to make these theater seats match your existing décor. Lane Marquee. The Marquee home theater chairs by Lane save space in two ways: they hug the wall and they maximize the amount of seats per row. They also come with pad-over chaise footrests for a matchless combination of comfort and support. The Marquee is a great model if you have to seat a lot of people in a relatively small area. Don't let a small living room or family room deter you from buying theater seats. Check out the wall hugger units available at TheaterSeatStore.com for home theater chairs that blend comfort and style in a space saving package.